Etsy is an e-commerce website for buying handmade and vintage items from micro-producers. Started in Brooklyn, New York in 2005 by college dropout Rob Kalin and his friends, by 2008 there were 1.3 million users. If Wikipedia is to be believed, as of 2013, that number has risen to 30 million. There are other sites doing a similar thing, like the english based Folksy.com, but Etsy is the biggest of its kind. The diversity of crafters with niche imaginations and skills is astounding, making it a great place to find original gifts and get inspired. You do spend time wading through stuff you’re not interested in or impressed by, but this is what makes finding something you like even more satisfying. Many will be items you’ll choose just to marvel at rather than buy (see below!) but marvel you will. For an emerging crafter it’s a great shop window, with millions of users you have access to a big established market. You just have to make something that people want to buy (the hard bit) and then make it stand out from the crowd through your gallery’s presentation, meta-tagging and personal marketing (the harder bit). Wearing a cut flower in your lapel is always elegant but unfortunately they don’t last too long. So how about something that doesn’t need watering and won’t wilt? You can wear these flowers on your ears, around your neck or as a brooch and on top of that they are completely hypoallergenic. This flower jewellery is made by wrapping copper, silver and different coloured wires into intricate forms and are the creation of Vmikro who takes her inspiration from nature. She does a range of butterflies too. Check out the Sunflower below, a one off piece – we think it’s rather golden, luminous and nice. Picture this……you have managed to get some tickets for Glastonbury, you have never been before and are unsure of what to wear. You want to fit in and enjoy the ‘scene’. What do you do? Hint: Buy one of these fabric flower crowns online, they are just the thing. Add that to a pair of wellies and all that’s left to do is find out what stage Dolly Parton is on? These little gnomes are the cutest of things. Made of glass and seemingly well crafted, they make a lovely gift for any plant enthusiast. 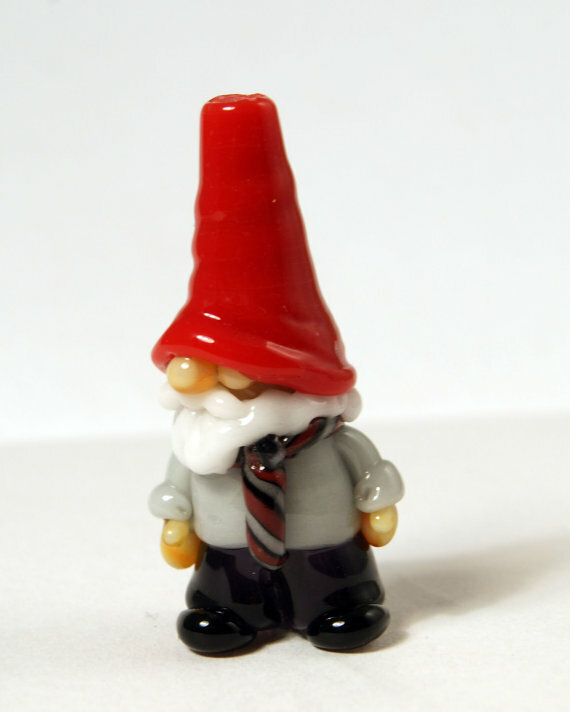 Take the Business Gnome, who wouldn’t want this little fella in their office plant pot for a pick-me-up at times of stress (along with the healing properties of the plant of course)? Their size is part of their charm, not too overpowering for the plants – more hidden, more gnome-like. One can imagine that collecting mini-landscapes can become rather obsessive if one allowed one to let it get out of control. Is enjoying a model tree inside a glass tube accompanied by little people weird? Maybe. But anyway we like them – they are nature aligned after all and you get to have trees inside. You wouldn’t believe how many crocheted or knitted cacti there are on Etsy. We chose these ones because they were so characterful and not afraid to express their feelings.